Sunglasses not only protect your eyes, it projects your personality and fashion. We have sporty, classic and trendy to fit all personalities and tastes. Sunglasses complete your fashion attire. The main thing about designer glasses is that they can cater to all tastes. Go ahead...create a fashion statement with our cool designer sunglasses. 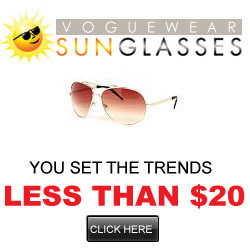 Our fashion sunglasses is a must have for the fashion savvy. We have Prada, Ralph, Revo, Ray Ban, Chanel, Exte, Fendi, Gucci, Oakley, D&G, Dolce and more. So with such a large number of designers to choose from, you are sure to find what you are looking for. On a Budget? Then Get Replica Sunglasses For Less!